I will discuss here about Pahari Paintings, the miniature art of India which is also known as Pahari miniature paintings (Basholi art). 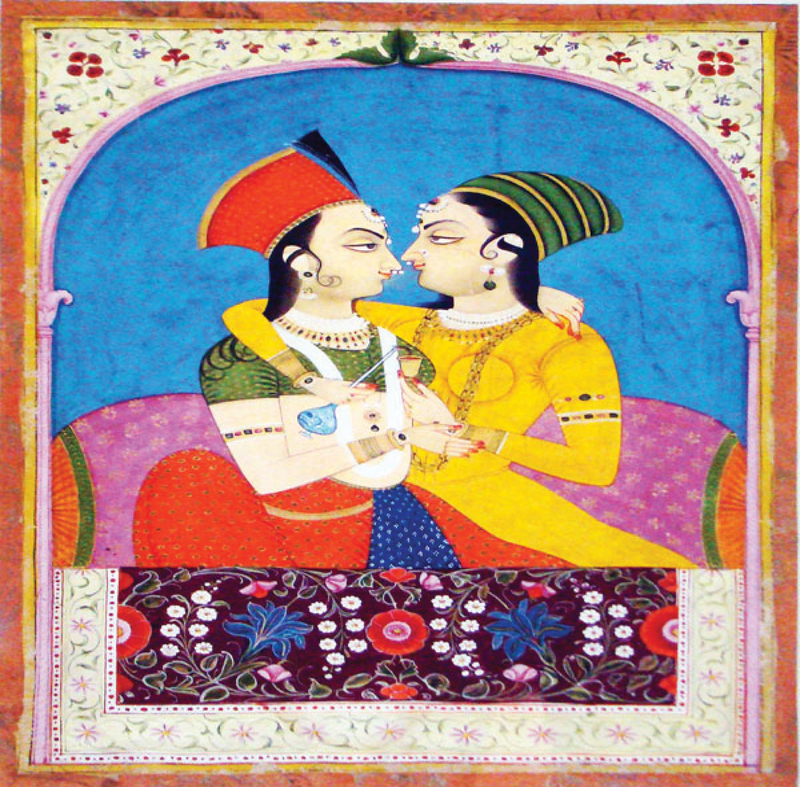 This Pahari miniature painting style has been established in Kangra school of art, situated in Pahari (hills) of Himachal Pradesh. Indian art have different styles and techniques in different places of India, most of the Indian art majorly known as miniature paintings of India, sculpture, art and crafts, music and dance ect. 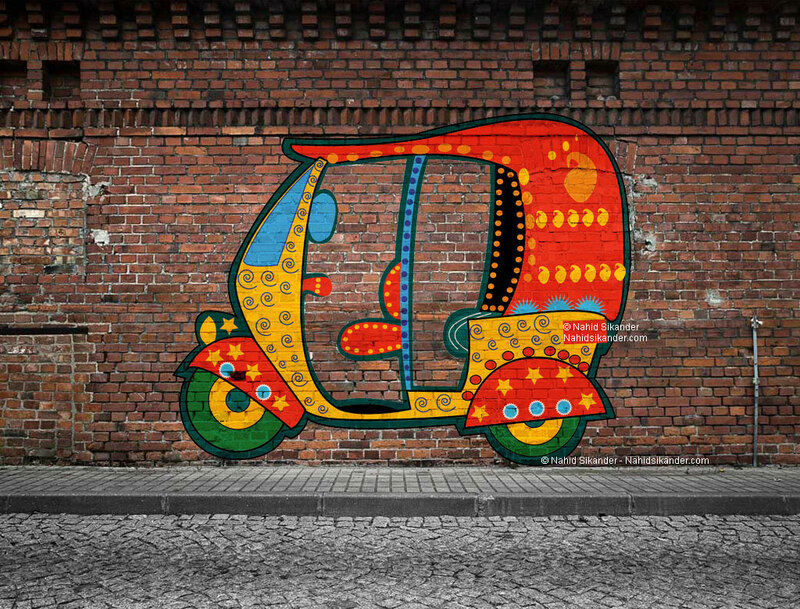 These different styles of art can be seen at different places of India from North to South and east to west India. 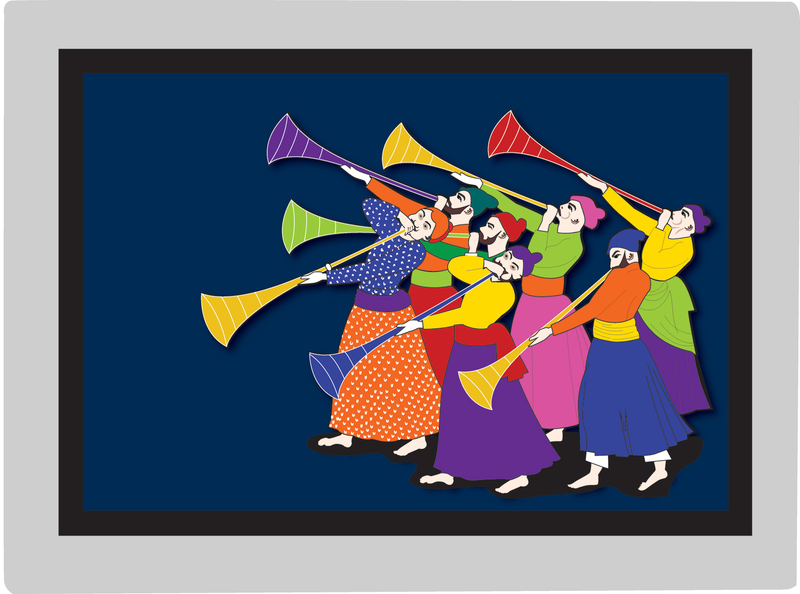 Every style of Indian art has their own characters and techniques, here are some examples, like Miniature paintings of Rajasthan, Miniature paintings of Pahari art – Kangra and Himachal Pradesh, Kalighat school of art Bengal, Madhubani painting from bihar, Warli Paintings from Maharashtra, Tribal art of India in various regions, Kalamkari art from Tamilnadu as South Indian Art, Tanjour Painting or Tanjavur art, sculpture art of various regions of India and each place has a different technique of making sculpture. The overall compositions of Pahari paintings are similar from the last few decade’s the art has been practising. The layout of painting balances the colours and the figures with background. The artists did not experiment much on the composition however they have made amazing art at its time to make an effective contribution to the Indian art. If we talk about so it can be seen that almost same kind of background have been developed for various paintings, and same kind of treatment has been given to them. Use of nature in paintings has been done beautifully. The features of faces can be seen in common style, so no much difference can be seen in faces. A detail work has been done in making trees and other nature objects in the foreground and background. 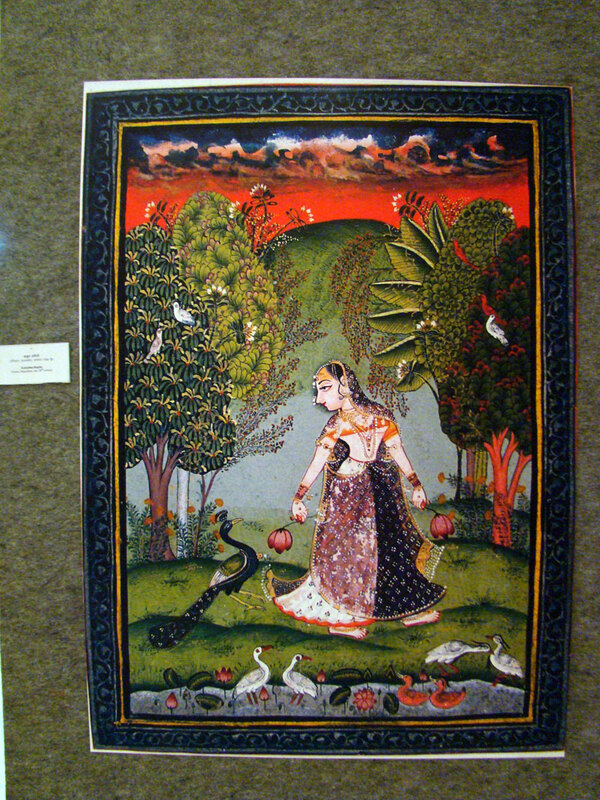 Pahari painting comes from Mughal art and Rajasthani miniature art. 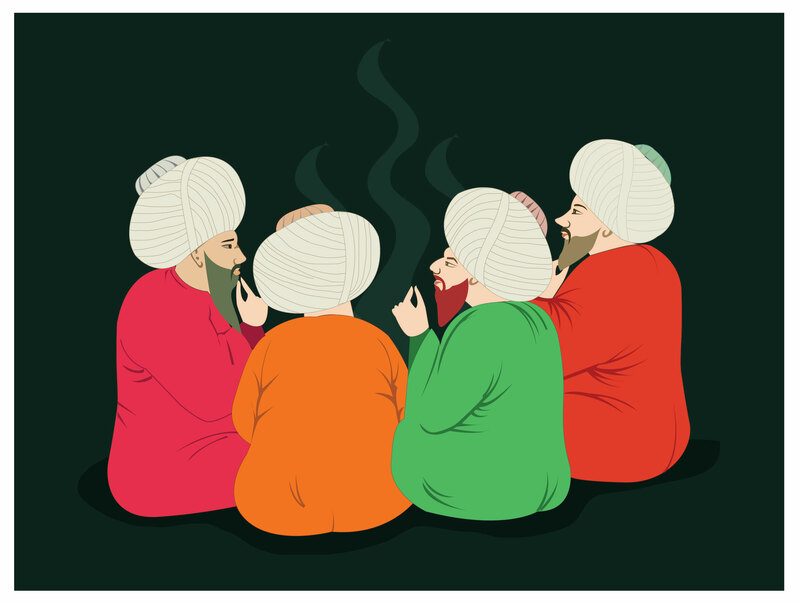 The painting style is similar to the mughal miniature art of India. 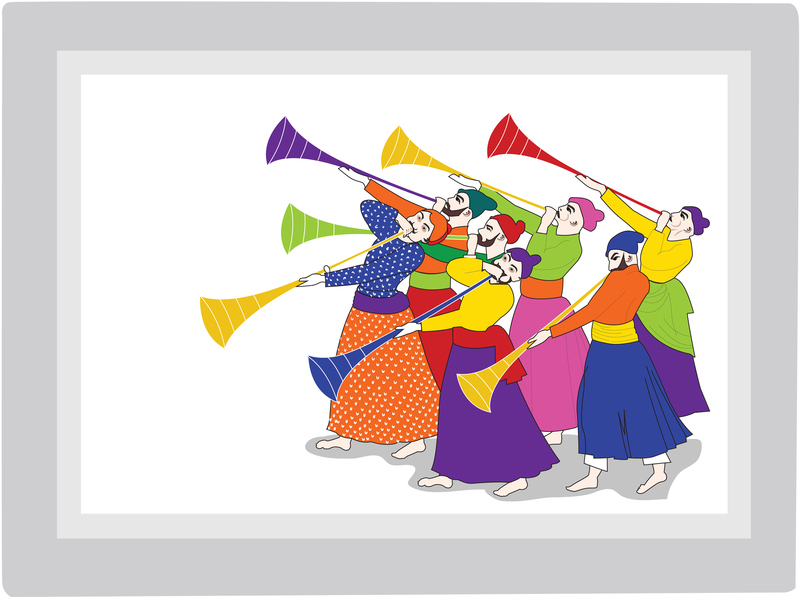 Colours used in Pahari Paintings are not transparent but poster colours (opaque colours ) instead of water colour. One can easily make the difference between the water colours and poster colours, the water colours are transparent although the poster colours are solid. The artist used colours in a very interesting way to make every details in the paintings. Detail work can be seen in the paintings with different shades of colours, and decorated with ornaments looks beautiful. Artists or painter added the beauty of the surroundings of the hills in most of the paintings, because of miniature size it was difficult to add many details, but the artist did this laborious job very carefully. The paintings can easily recognize by their hilly looks and details, like the green mountains covered with blue sky, drawing of trees available in the hills, and decorative motifs and textures added. Indian art also known as detaild miniature work which can be seen in the pahari painings style in which have too much detailed work have been done by different size of brushes and pen by various artists of that time, specially by “Nainsukh”. This can be seen in all the paintings like trees, decorated buildings, dresses, ornaments details, figures detail work specially in fight scene, group scene etc. In Indian art generally Krishna lila scenes were basic subject for pahari paintings, however some other themes were also painted by artists, but majorly the gopy with Krishna, women with Krishna, god and goddesses, fight scene, dance by gopies and women, love scene were dominantly painted by Indian artists. 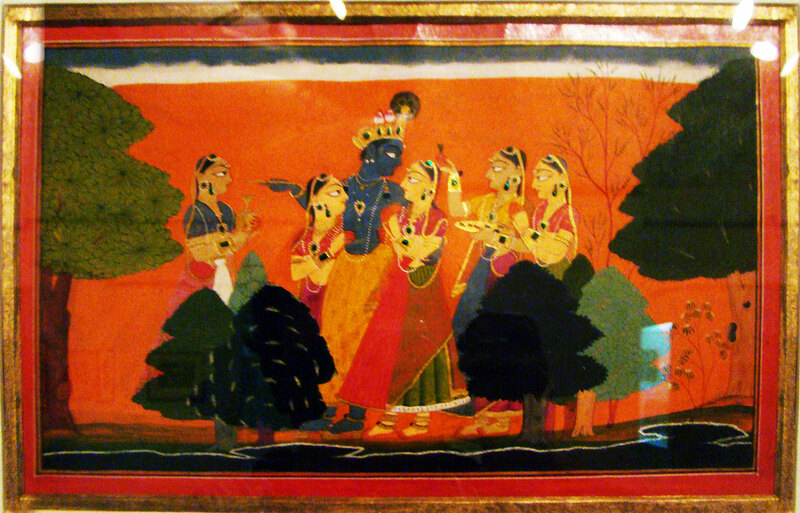 Ras leela can be seen in most of the paintings, Krishna playing with women called gopy (gpies) and Radha. Bathing scenes of women (gopies) in the lake of village are famous in which Krishna steal the clothes and climbed up the tree and gopies without clothes comes out from the water pond and asked Krishna to give their clothes back. 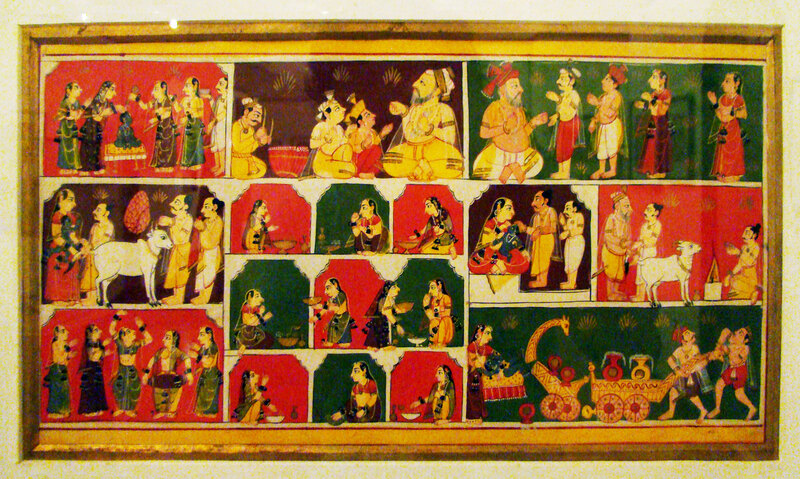 Argument scene between Krishna and radha and gopies, meeting scene in the jungle, playing scene, having food in the forest, killing of devils, cow feeding in the jungle and playing with the cows were general theme of the paintings of this India art style. Apart from it there are several paintings available on the other different themes, like mughal kings darbar, fight scene, army shown on the horses and elephants, shikar (hunting), love and other scenes. 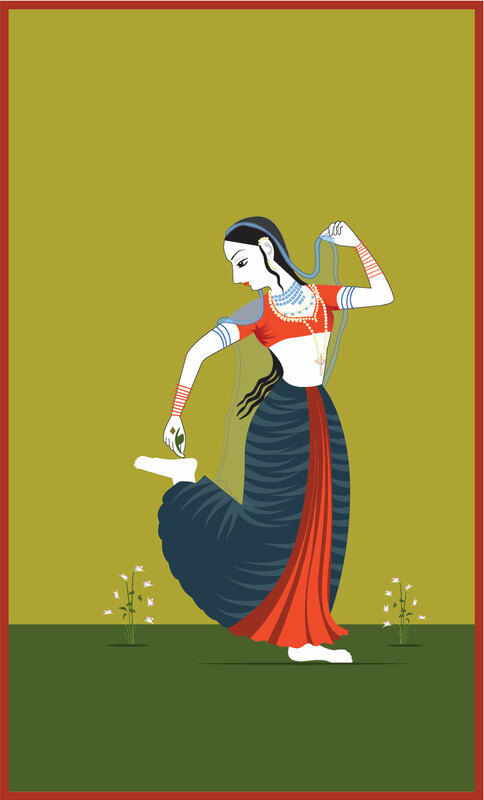 Mythological themes also have the significant place in the Pahari school of art. Themes from Ramayana and Mahabharata were also popular in the pahari school of art due to the acceptance by the society on the belief of god. The god and goddesses, demons are also painted according to the theme taken by the artists. Each and every painting tells a different story with the same method of painting. Pahari paintings are famous as Indian art and colours used in Indian art or pahari school of art are very vibrant for subject and in contrast the colours used in background are very cool and calm with soothing effect. 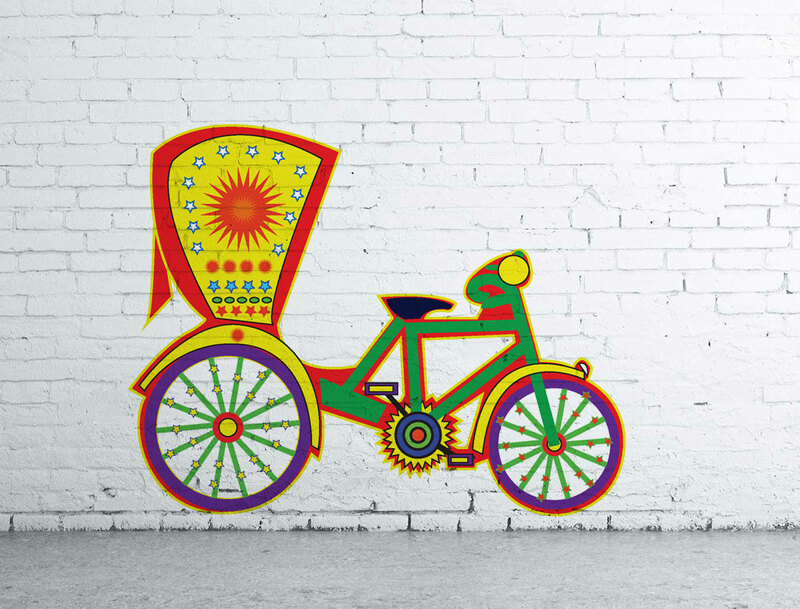 In Indian art the figures used to paint with bright hot colours so that they can be seen as prominent in the whole frame. The Indian art known for colours and contrast so the hot colour family was used to paint dresses and other important objects of paintings and in contrast the cool colours family used to paint landscape and other supporting objects in the background. 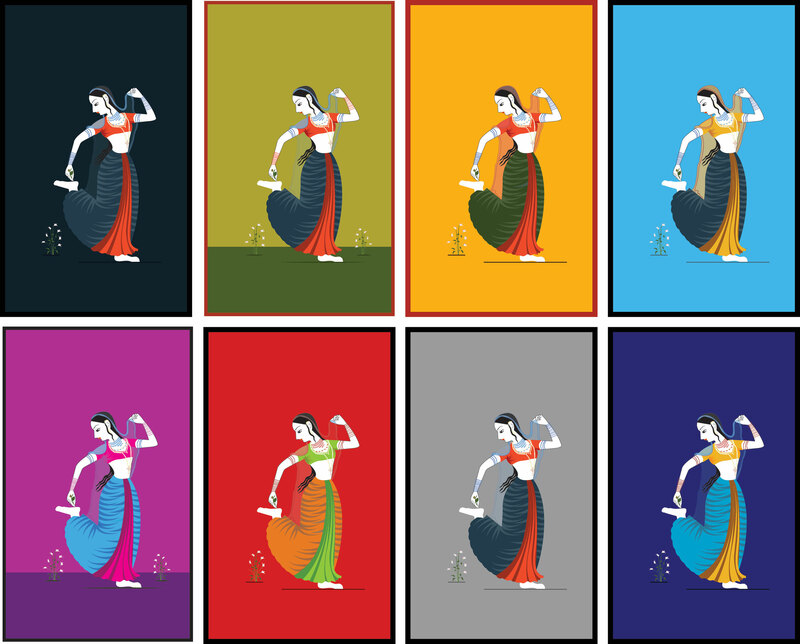 We can see orange, yellow and red dominantly used in the making of figures inIndian paintings. Opposite to it the cool colour family used in the background to create a strong contrast in the Indian art or Pahari school of art. Green and blue colours shades were used to paint landscape, like Mountains Rivers and trees in the background and foreground. Some time hot yellow, orange and red were used in flat background I painting which can be seen in some of the pahari paintings itself. Generally pink and peach colours used to paint the body of men and women, but when god and goddesses shown in the painting the different colour used to paint them according to the mythology descriptions about them. Generally Krishna painted in blue colour with yellow dress according to the mythology belief, but some paintings have used same blue color fro demons also. 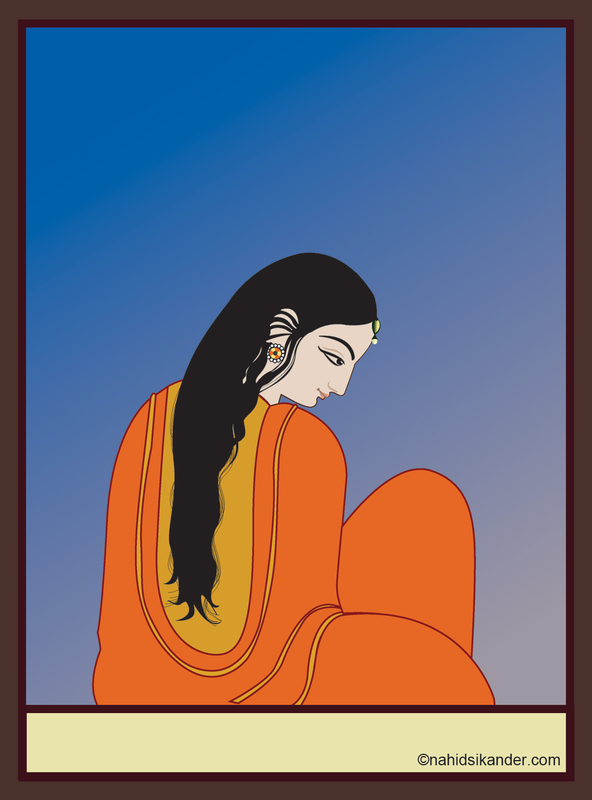 Heavy contrast can be seen in the pahari School of Art style. The Pahari miniature painting style is an assets to upcoming generation, we should understand about history of Pahari paintings to preserve this magnificent art style for people around the world. It shows us the culture and living practices of people have used during that period. So to move ahead we should also consider about the history of living practice done by the people.It also connect people around us and share amazing experiences for better understanding about life. Indian art known for its colours and disparity thus the Indian culture known for its traditional art, we cannot separate both from each other. It is evident that Indian art consists of various art forms at present days, however in ancient period the Indian art had been famous for different kind of sculptures, for that various kind of stones, metal and mixture of metals were used to make a variety of sculptures in a range of Indian art styles. Later the Indian artists developed different painting styles in different regions, influenced by the cultural and religious practice of people of India. Most of the art developed by the Indian artists were based on religious subjects, and was very successful in that period even though maximum number of art pieces sold in India is based on religious topics till date. 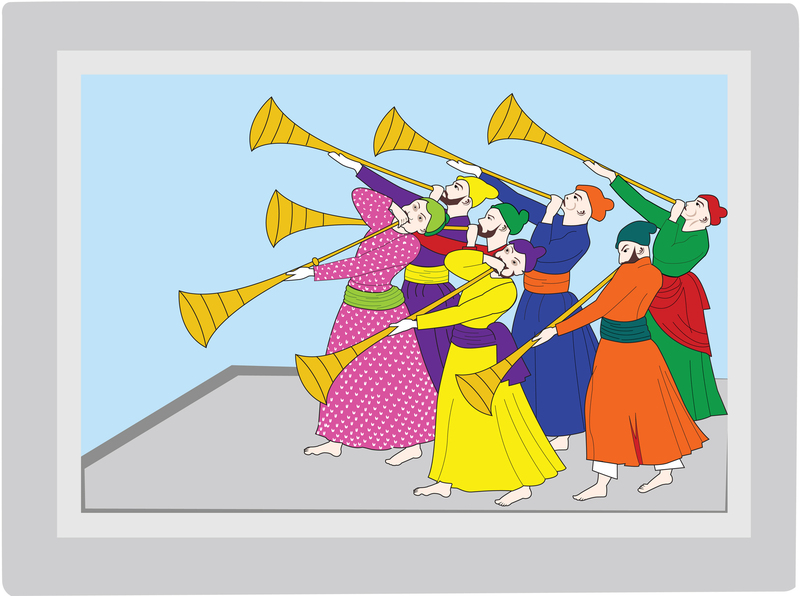 And yes music and dance are also part of Indian art so we cannot ignore them. The art had been flourishing in India since it is started and artists were busy and had enough business in making sculptures for temple and other royal buildings. Different regions have different style of making art pieces whether it is a sculpture or a painting. Several Indian artists developed different styles of paintings in different periods known as Indian art. 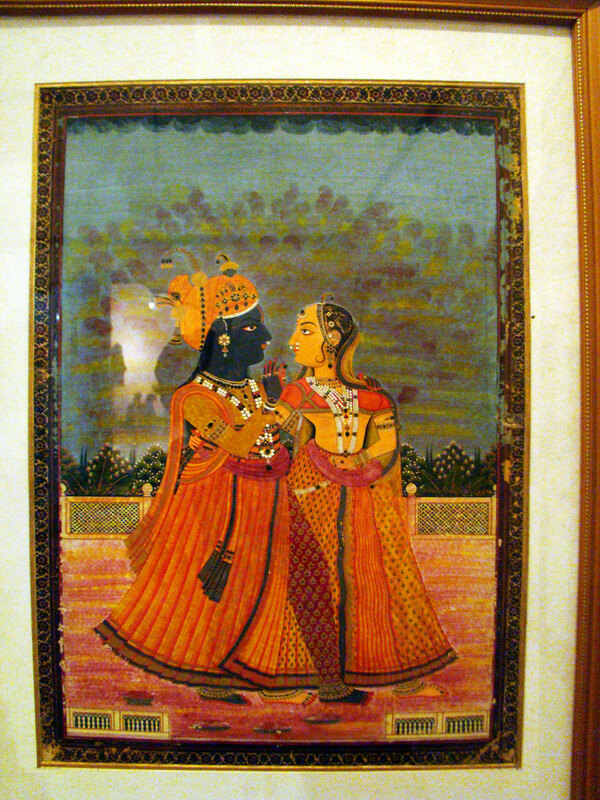 The paintings styles including Indian miniature paintings can be find in various regions, Mughal miniatures mostly North India like Rajasthan, Kangra/Guler school of art, Pahari paintings belong to hills areas of India like Basholi, Chamba in Himachal Pradesh and kashmir, Madhubani art Bihar, Kalighat school of art West Bengal, kalamkari and tanjavur painting style Tamilnadu, warli paintings – Maharashtra, pattachitra belong to Odisha etc. India is also famous for its art and crafts made by hand called Indian handicrafts. The styles including Bidri art style, metal craft of India differs from their North Indian and south Indian style, sculptures from north and south India are different in style and methods of making are also different. Terracotta art can be find in every village of India, stoneware, ceramic, Blue pottery, black pottery etc. Handicrafts also included textile art, eco friendly-crafts, jewellery, wood crafts etc. India also known for its various folk art, tribal art and classical music and dance forms belong to various regions of India, Howevre there are several folk and classical dance forms in India, but some of the famous dance forms are listed here like Bharatanatyam dance form belong to Tamilnadu, Kathakali dance – Kerala, Odissi dance (nratya) Orissa, Manipuri dance, Bihu dance belong to Assam state, Bhangra – Punjab, kuchipudi – Andhra Pradesh, Kathak – North India, Kalbelia Rajasthan etc. 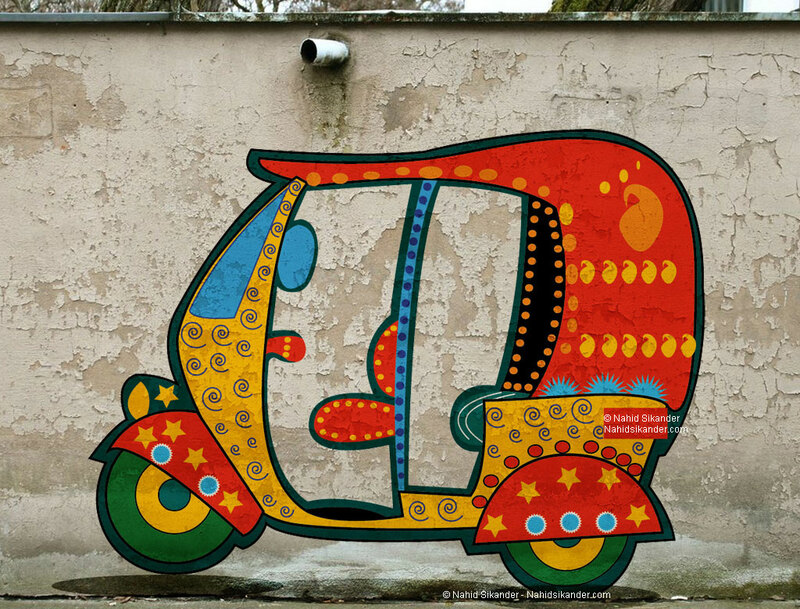 Next Article will be on Contemporary Art of India. Mughal miniature style which is developed in Rajasthan. This is Kishangarh art style painting, comes under rajasthani Miniature Art, a mixture of Indian and persian miniature art (Mughal miniature painting). 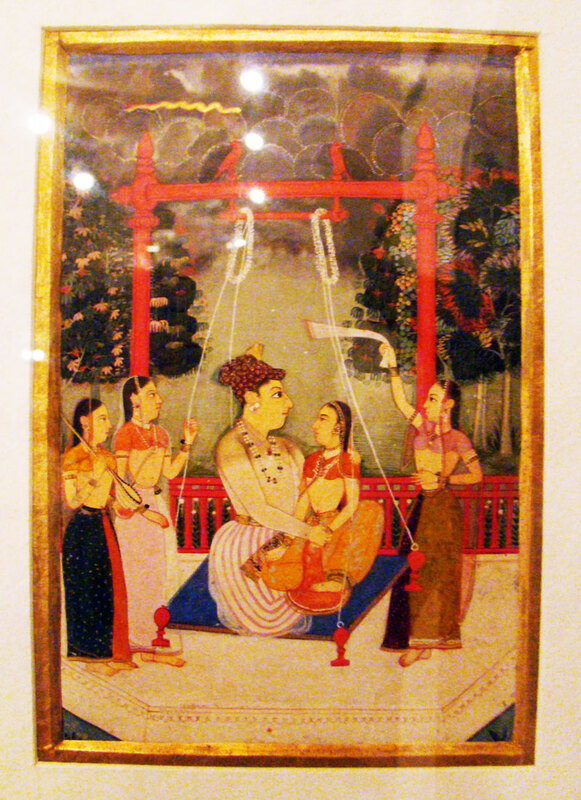 This is a from one of the contemporary art of India by unknown artists from 17th century India. Same style done by One of the great painters of that period was Nihal Chand, he made several miniature paintings which are the marvel of current era, so it can be one of his painting. 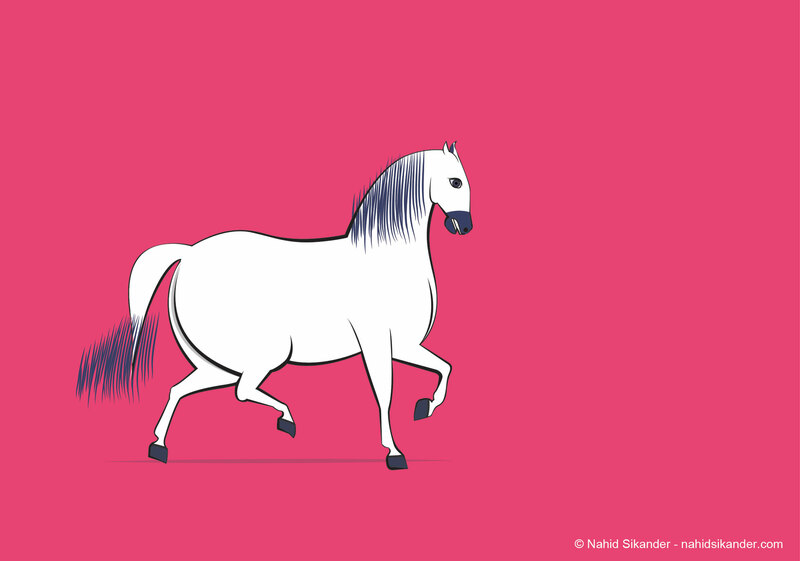 There is a little confusion about Indian art, Mughal art, Rajasthani art and Pahari art style. When mughal came to India they had brought so many things with them and art was one of the important element of them, whether it is a textile art, architecture, paintings or sculpture art. After settled down of Mughals in India a different art style had been developed by mixing Indian and Persian art style, which is later known as Indian mughal Art style, how ever it is developed at the time of mughal period so it is also called mughal miniature style and it has been done in Rajasthan by Rajasthani artists so it is also called Rajasthani miniature art and the pahari miniature are aslo influenced by rajasthani miniature so we can see the similarity in all three styles we have discussed about. So over all they had been developed in India so we can say it is an Indian art style.